Jamaican Food - Delicious and Authentic! At Tropical Diner West, we serve only the highest quality authentic Jamaican food, including the best jerk chicken in Houston, TX! We offer both a buffet and individual dishes, and we have a full range of appetizers, soups, salads, and beverages. For an appetizer, try our jerk wings, coca bread, or beef patties. We have several different soups, including chicken, beef, pea, and Mannish water. Our salads include jerk chicken, Caesar salad, and coleslaw. •	Jerk Chicken—This is the first dish that many people think of when they think about Jamaican food, and it doesn’t get any better than ours! Our jerk chicken is marinated in the perfect blend of spices and delicious Jamaican jerk sauce, then grilled and smoked to perfection. •	Oxtails—If you have never tried oxtails, you are missing out! We season our oxtails with a special blend of spices, and stew them until they are perfectly juicy and tender. •	Brown Stew Chicken—Less spicy than jerk chicken, this dish is seasoned with special spices and then left to simmer until all of the flavors combine. •	Curry Goat, Chicken, or Shrimp—Your choice of meat, marinated and seasoned in curry and a mouthwatering blend of Jamaican spice. •	Ackee and Saltfish—This is the national dish of Jamaica, and can be eaten for any meal: breakfast, lunch, or dinner. We have side orders like plantains, roti, and rice and peas to accompany whatever entrée you choose. No matter what you order, we promise that you will be satisfied! If anything does not meet your expectations, let us know and we will fix it. We also serve Caribbean Food! 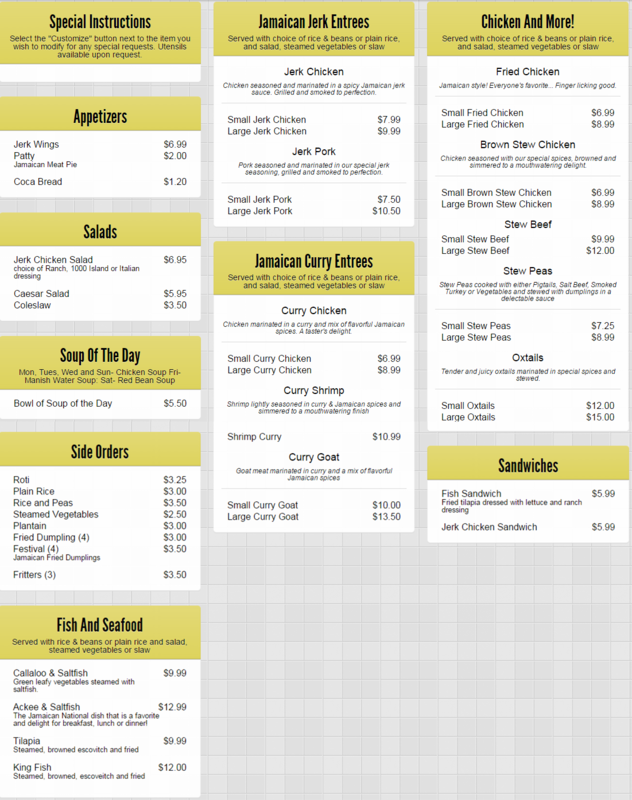 Visit us today for the best authentic Jamaican food in Houston, TX!